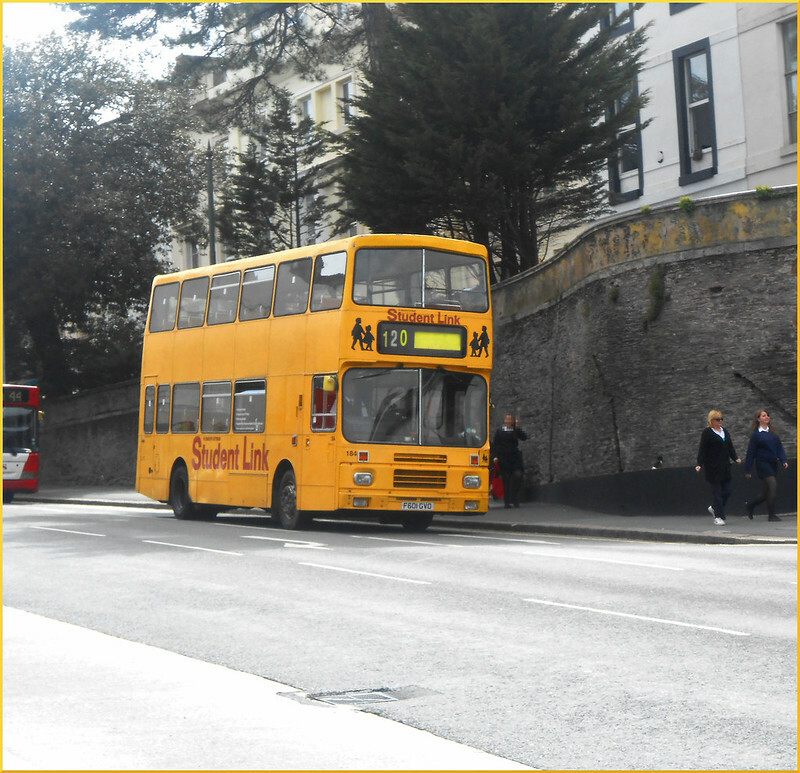 Three nice shots of Student Link buses 184 185 186 which are now withdrawn from service and pending sale for scrap. It is a real shame to see these fine buses go; their reign really is finally coming to an end. A great deal of the schools drivers love them too, and definitely appreciate their extra power over the EVL/PVLs. 185 was the best – it sounded spectacular and it went like hell! Though all good things have to come to an end, and they have outstayed their welcome by many, many years. The remaining 3 (181, 182 and 187) I expect will continue service until the end of the school year, same for 177 and 178. (Both still going though 178 is parked on the gravel on the ‘Engineering line’ on what we used to call Death Row’). Not sure if 181 will last much longer. I followed it back from Yelverton tonight and it was jumping gears and stalling when idling. Sounded really rough and was clearly limping back to the depot. That might have been its last ever run unfortunately. Unless the Milehouse mechanics can work some magic? Shame to loose them, because they were absolutely perfect vehicles for this area. Very powerful and solid machines. They really do fly! Their acceleration is simply amazing, especially when compared to a B7. 181 is always a bit variable in terms of how well it drives; on June 14th on the 50 it had a dreadful squeal whenever the accelerator was engaged which got worse the faster it went (skip to 4 minutes). Last Friday 181 on the 50 was absolutely fine! Whereabouts from Yelverton did you see/follow it? 181 is assigned to the 124 to Milton Combe/Buckland Monachorum and then runs dead to Derriford and returns to the City on the 1712 50. If it came from the 124 and ran dead to Milehouse then there was clearly something very wrong with it. I really shall miss them, despite the odd mishap they have to be some of if not the most reliable buses Citybus have operated. They really were superbly put together, incredibly reliable, powerful, and certainly haven't lost any performance. If 181 has gone it's just 182 and 187 of the yellow ones left and 177/178. Last Friday 187 was on the 121 (!) and 177 was on the 128. @Tom I was in the car on Thursday evening and followed 181 from Yelverton roundabout through to The George. We were both praying it would not break down in the roadworks at the Tesco roundabout! Lost it at the George Junction traffic lights, so I don't know where it went after then. More often I work a few afternoons a week near Yelverton and normally cycle. On my way home I often pass the 124 as its heading down the lane to Milton Combe. It then normally passes me again as it heads back towards the A386 at Yelverton, running empty. In recent weeks the B7's have been making more of an appearance on the 124. I have not ridden on a B7 yet, but presume they are like the underpowered B6 Wrights that First operate? It then runs empty/dead to Derriford Hospital and returns as the 1712 Service 50. If you followed it empty down towards the George Junction it would've been heading to Derriford for the extra run of the 50. 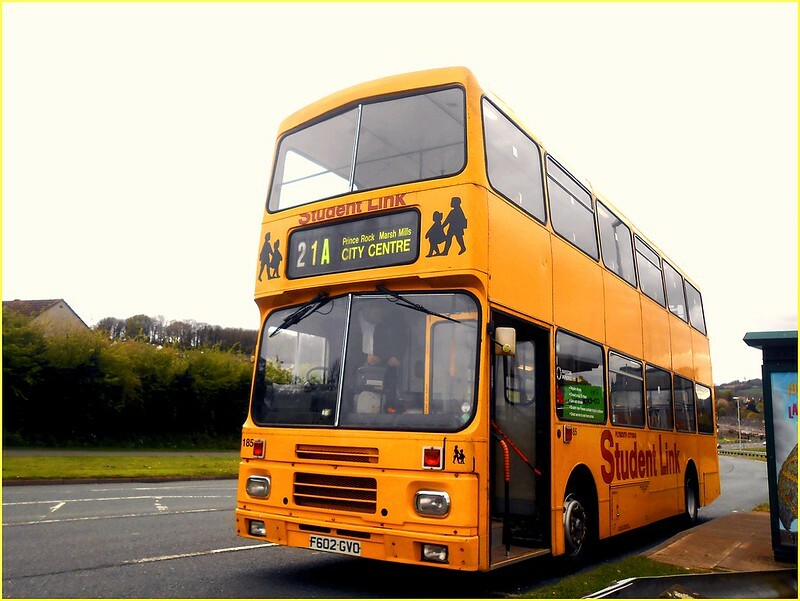 The 129 to Horrabridge is down as a yellow Volvo decker, though B7s are becoming more and more common on it. Upon reaching Horrabridge Manor Garage at 1635 it runs dead to Derriford Hospital and returns as the 1707 29. As for the Ex-London B7TLs, yes, they are woefully underpowered and cannot cope with even the slightest hill. Here's a brief example of 412 on the 50 up Keswick Crescent. It certainly isn't uncommon for them to overheat on things like the 121/122 to Dobwalls and Kelly Bray respectively. (Though the 121 has had quite a few B10Ms in recent weeks). Back to 181, I caught it yesterday (Friday 5th) on the 1712 50 from the 124, absolutely no problem at all. Still pulled well, no screeching/jerky gear changes/stalling, drove perfectly; all in all it still has many years of life left in it! I agree Tom, they are definitely the best work horses they've ever had, along with the Atlanteans, who provided a good, solid service for many years. I wonder how long their current fleet of buses will last? 181 was on the 124 again tonight. Sounded much healthier than last Thursday! Good see whatever problems it had last week have been fixed. It just goes to show even the mechanics must have a 'soft spot' for them! Given that exactly a week today will be their last day and they're still spending time fixing them it shows they must be popular - and not just with enthusiasts! 178 was on the 129 that then does the 1707 from Derriford 29 yesterday. Caught 178 on the 1707 29 - she still absolutely flies! Fantastic bus, supremely comfortable and a very enjoyable trip.